On December 2, Perry Robinson, the virtuoso clarinetist and free-minded spirit passed away at the age of 80. Robinson was a real "musician's musician", very sought as a member of bands and possibly the clarinetist of the early free jazz movement in the 60s (next to Jimmy Giuffre who was on a slightly different musical track). His first album was one with Henry Grimes - with whom he's kept a special relationship throughout his career - Paul Motian and Kenny Barron, just to show that excellent musicians find themselves from the start. Then he performed with Archie Shepp, was part of the famous avant-garde jazz big bands of the seventies: the Jazz Composers' Orchestra and Charlie Haden's Liberation Music Orchestra, while at the same time, across the Atlantic, performing extensively with German reed-player Gunter Hampel. He performed on more than 120 albums, of which a about a dozen were released as a leader, or one album every five year. 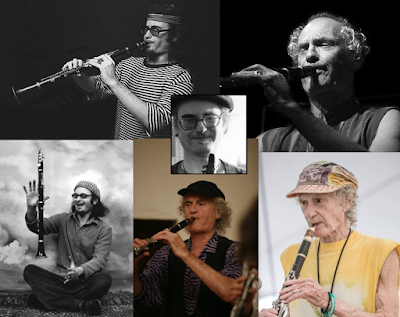 That he was highly esteemed by his colleague clarinetists can be demonstrated by his participation in the Clarinet Summit, a multi-country ensemble of some of the best clarinetists around in 1979, including John Carter, Gianluigi Trovesi, Bernd Konrad, Theo Jörgensmann and Ernst-Ludwig Petrowsky. It is also not suprising that other clarinetists like Hampel and more recently, Polish clarinetist Waclaw Zimpel, asked him to join their bands. He was also a citizen of the world, a free spirit, and basically open to play in any type of configuration or jazz genre, and he was even part of Klezmokum, a Dutch klezmer band, created by Burton Greene. This jewish heritage also shone through in his other collaborations with Anat Fort, Rozanne Levine and Waclaw Zimpel. But whatever the genre, his approach was virtuosic, soft-toned and inherently melodic, often capable of combining tradition and adventurous moments in the very same solo. We will cherish his heritage. Watch his performance at the Kanjiza Jazz Festival (Serbia) in 2011 with Matthew Shipp, Ed Schuler and Ernst Bier. Stef, thanks for this really nice tribute to Perry Robinson. I am always excited when I find a recording with Perry on it, you'll never know where they will turn up! In fact, you never knew where Perry would turn up. I recall once being in Seattle and seeing that I had just missed him playing at a cafe, and recently, I ran into him playing at bar in Beacon, NY. Years ago, I had the pleasure of having him sit in with a group I was playing with in Hoboken. It was an incredible experience to hear how he worked his magic around some pretty crude players! He has some recent recordings to listen to as well - with Max Johnson and Diane Moser he released 'Top of the Head', and an update of Clarinet Summit on Jazzwerkstatt last year. His autobiography "The Traveler"co-authored by Florence Wetzel and published by Writers Club Press is an interesting read and still available on line as far as I know! One of his own favourite quartet albums was 'Angelology'. Earlier albums by the same quartet were 'Nightmare Island' and 'Call to the Stars' (which I am listening to now). RIP. tape from Jackson MacLow which also has sister Jeanne Lee. sadly, within the last decades almost invisible in Europe, nobody cares. please just take a short nap, Perry, then join the big orchestra.